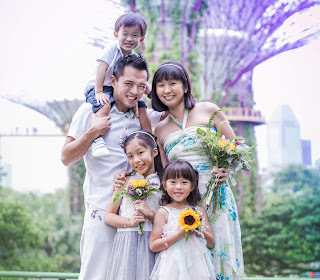 So, the recent haze has kept us indoors more than we would like to be and on some days, it can be a little challenging coming up with activities to occupy the kids. Last week, I took a look through our stash and came up with a very simple DIY craft we could make which would hopefully provide hours of fun! I've always wanted to make a marble run for the girls after seeing pictures of it online, then I thought of something even better - why not turn it into a learning game instead? With the preschooler now learning about addition and the toddler trying to recognise and write the numbers from 1-10, I wanted it to be a simple number game using a scoring system. 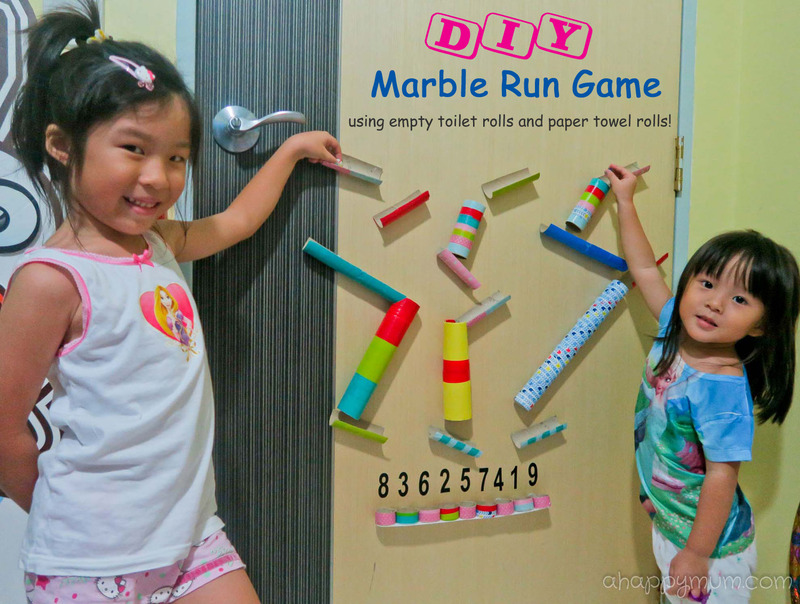 In today's Creativity 521, we share all about our DIY Marble Run Game! If you've got empty toilet rolls lying in the house and are wondering what to do with them, this might be of help! We were all ready to begin! Firstly, wrap and cover the rolls with washi tape or any coloured tape. If you do not have these, you can also use coloured paper instead but make sure you apply glue on the entire piece when sticking it onto the roll. Angel was the one who suggested "Why not let's make some rainbow rolls?" and went on to use assorted tapes on the rolls. And it made me realise that sometimes the kids are able to think out of the box better than me, who did the rolls in a boring and monotonous way. I found it easier to put horizontal strips of tape onto the roll and then cut each one accordingly. Ariel is really into cutting nowadays so that task was delegated to her. Repeat until all your empty rolls look vibrant and colourful!! Cut some rolls into halves and join some together to make long tunnels so that you can have a variety of building tools for your game. You can also cut out a semi-circle at the top of a roll to enable it to join to another and act as a chute (see examples in our final design). I also cut out a two toilet rolls to make a total of nine marble 'holders' which were 2cm in height. Next, I stuck them together side by side to form a horizontal row and secured them onto a piece of rectangular cardboard as shown below. Add in numerical stickers for the score, based on what is easiest and hardest to achieve. Start building your game using the toilet rolls! You can do it on any wall, door or even window too. It's all about angles and speed so do make sure you keep testing your route with the marbles as you go along to make sure it works. How did we stick the rolls to the door? Well, using plenty of Blu-Tack (yes, it works and looks much neater than using lots of tape)! The best thing about using Blu-Tack is that we can adjust or shift the rolls anytime we want to fine-tune or make a new marble route. Ta-dah! This was how our game looked in the end. We set up three starting points so that the kids could have a choice of where they wanted to begin. Now, the rules of the game is easy - each person gets three marbles in a turn, let them roll into the holders at the end and add up the points to see how much you score! I must say the point system really motivated them to keep trying for a better score and it was definitely a good way for them to learn about math at the same time. This is definitely our favourite game in the house for now and the kids make sure they have a few turns every night before they sleep. Here's a look at how it works! Fun, right? Won't you have a go at making your own marble run game too? Tip: Marbles can get a little noisy at night especially when they fall out, the good news is you can substitute them with pom poms and have just as much fun too! P.S. 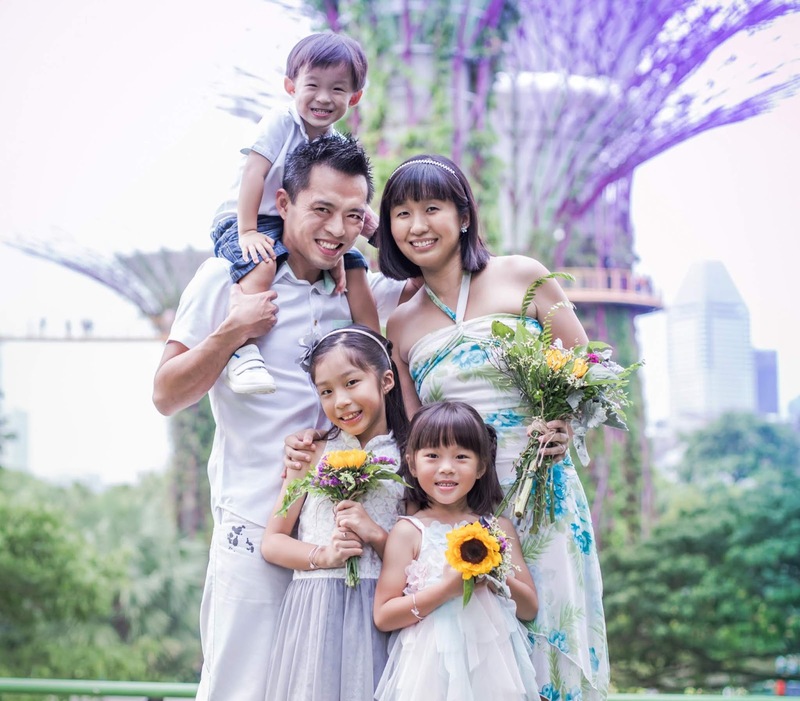 We still hope for the haze to go away soon so we can head for some outdoors fun! I LOVE THIS! I need to start collecting cardboard rolls so that I can make one too. Thanks for sharing! This is so cool! Am so going to try this with my girl. Thanks for sharing!! You have very interesting idea.. it look so much fun! I've seen a lot of marble run activities but to include math in it, smart momma! The pompoms are a great idea too!